Pungent organic compounds made by a variety of plants to attract pollinators or avert predators in nature. Over 100 different types of terpenes have been found in cannabis, each strain having a unique composition. The full interaction of all cannabinoid & terpene compounds within the body's endocannabinoid system after cannabis is inhaled or ingested is known as the "entourage effect". The individual terpene profile in each strain influences the "high" one experiences due to the synergy/intercommunication of the compounds in that flower. Terpenes are fragile so to prevent degradation of your cannabis, store in a cool & dark place. 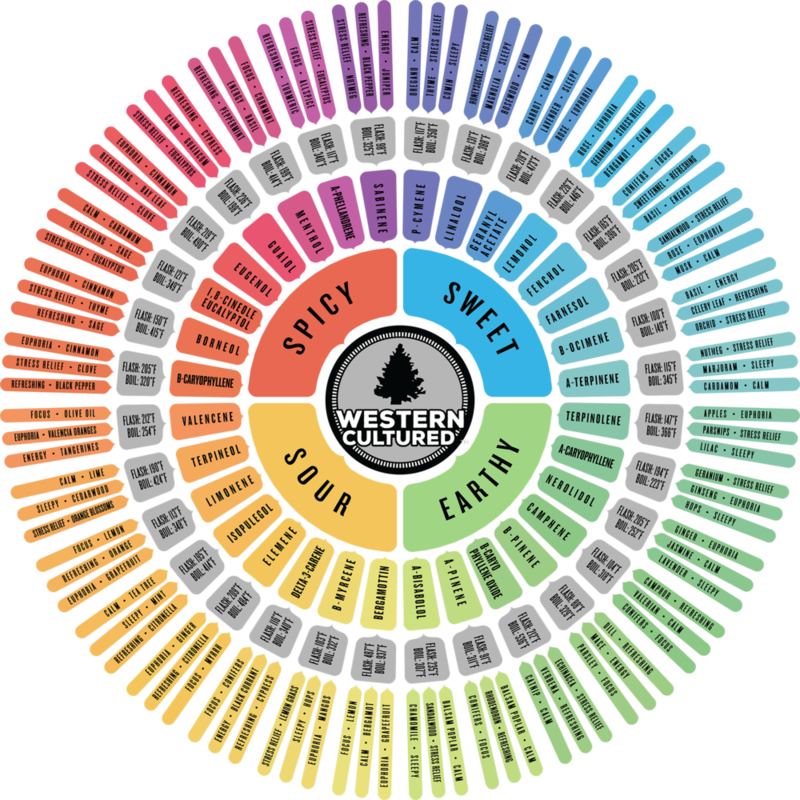 We’re excited to share our updated terpene wheel! We’ve added eight new terpenes, simplified the effects to the seven most common physiological responses reported by consumers as well as boiling and flash points. The seven effects are energy, sleepy, stress relief, calm (relaxing), focus (creative), refreshing (uplifted) & euphoria (happy). We’ve added this information to our new glass jar as an educational tool for our fantastic customers to learn more about our products and how cannabis interacts with them. The flash and boiling points were added to our terpene wheel for the benefit of concentrate consumers. Boiling point is the higher temperature at which a liquid (oil) converts to a vapor (smoke). Flash point is the lowest temperature at which vapors ignite using a direct fire source (flame). At certain temperature points you will taste individual terpenes and experience their unique effects.